Maui High School’s HOSA—one of six Pathways. Home Columns Maui High School’s HOSA—one of six Pathways. Maui High School is the largest high school on Maui, with approximately 2,000 students, and is the sixth largest school in the State. (Baldwin High School, with about 1,500 students, is the tenth largest in the State). This year, according to Maui High School principal Jamie Yap, more than 600 freshmen were expected to enroll at Maui High School. Maui High School HOSA show their pride at the Maui Fair Parade. Incoming freshmen will have an opportunity to enroll in a Career and Technical Education (CTE) pathway course. Through CTE, students have the opportunity to develop academic, employment, life and technical skills. There are six pathways: Arts and Communication, Business, Health Services, Industrial and Engineering Technology, Natural Resources, and Public and Human Services. The Health Services pathway includes clinical health, medical biotechnology, entry-level health professions, and health/nutrition. Maui High School HOSA at Orlando, Florida. As part of the Health Services pathway, Maui High School has a very active HOSA (Future Health Professionals) organization. 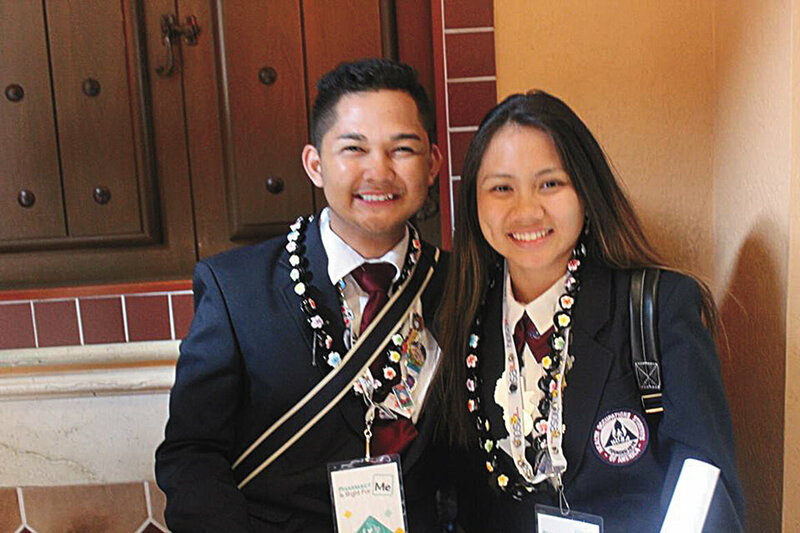 Maui High’s HOSA started more than ten years ago in 2006. HOSA is an international student-led organization whose primary goal is to promote and guide students toward career opportunities in the healthcare field and teaches students on how to deliver quality healthcare to all people. Sheena Garo, the 2016–2017 HOSA Vice President said she learned many skills through HOSA: “Some essential skills I have learned through HOSA include CPR, First Aid, tri aging an area if a natural disaster were to occur, and even simple, yet helpful techniques such as proper hand washing, proper glove removal, and how to present yourself as a healthcare worker toward potential clients. All these skills are definitely essential for every healthcare worker and being taught these skills in high school allowed me to get a head start to practice my skills toward patients in my community.” Rose Rafael, the current HOSA Director of Communication, dreams of working at a health facility: “With the help of being in HOSA, I was able to gain more knowledge of the different branches in the medical field.” “All I wanted was to help sick and poor get better, but HOSA helped me decipher what health profession I wanted to become in the future,” said Selwyne Jei Matillano, the 2016–2017 President. Matillano also explained that it was HOSA’s mission to volunteer. “Not only is this HOSA’s mission, but we make it a priority to give back to our community which served us our whole life.” HOSA members organize a date to volunteer at Hale Makua’s Bingo Nights, where they help the elderly and listen to their stories. 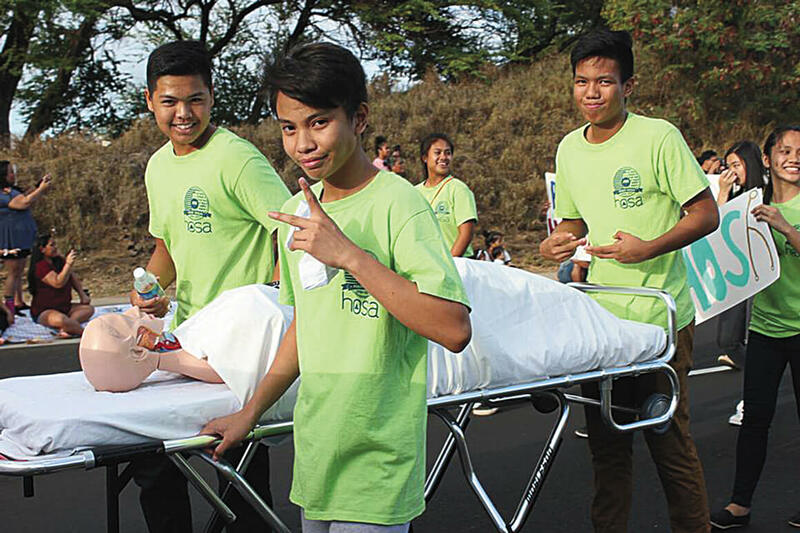 In addition, HOSA has volunteered for Kidney Da Kine Day, Haleakalā Lions Club, Maui Disability Alliance, Ho‘omau, and Maui Food Bank. Through HOSA, many members have participated in competitive events. “The members compete in competitive events focusing on the medical field against other students locally and internationally,” details Genesis Balaan, HOSA Chapter Treasurer. The first event is the regional, followed by states, and then International. 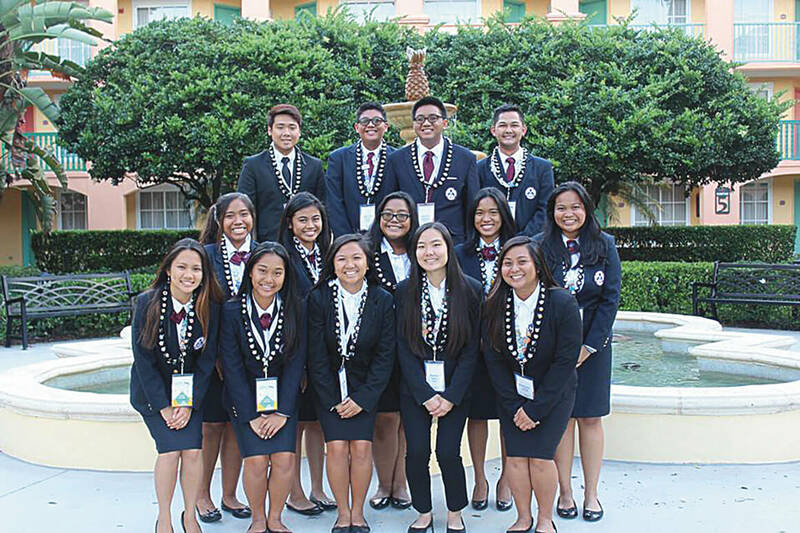 In February, Maui High’s HOSA members were gold, silver and bronze winners at the statewide Career and Technical Student Organization Convention, held annually at the Hawai‘i Convention Center in Honolulu. The state winners were eligible to attend the 2017 HOSA International Leadership Conference held this past June in Orlando, Florida. The Aspili, Magno and Versola team placed 2nd overall in the Health Education competition. In 2016, the same team, with BlessieMae Paguirigan, placed 1st overall in Health Education while Jamaica Aquino and Sheena Garo placed 5th overall in Health Career Display. Matillano is currently attending Kapi‘olani Community College on O‘ahu as a nursing major and plans to earn both a Bachelor’s and Master’s degree in Nursing at the University of Hawai‘i at Mānoa. He hopes to become a Certified Registered Nurse Anesthesiologist. Garo is also attending Kapi‘olani Community College and will major in Radiologic Technology, with the hope of eventually becoming a radiologist. Hawai‘i will be honored to be in possession of such admirable and determined workers to serve our state. Google® Is Not Everything is a monthly column authored by high school students. The title of the column emphasizes that education is more than just googling a topic. Google® is a registered trademark. This month’s guest columnist is Angela Cainguitan, a senior at Maui High School. Angela is an Advancement via Individual Determination (AVID) student at Maui High School and is interested in becoming a surgical technologist. She is also active in the youth program at Good Shepherd Episcopal Church and was selected as one of fourteen youth in the State to represent Hawai‘i at this summer’s Episcopal Youth Event in Oklahoma. Angela is the daughter of Benny and Julita Bumanglag.